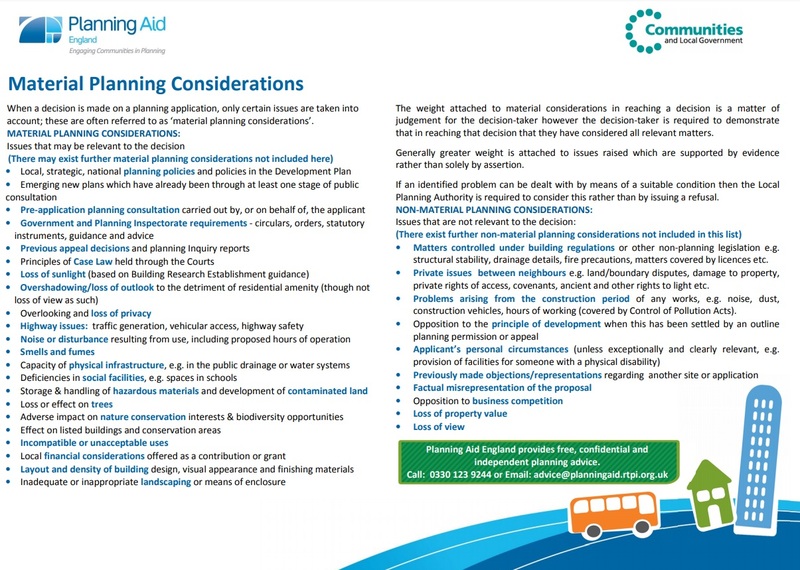 Planning control is the process of managing the development of land and buildings. The purposes of this process is to save what is best of our heritage and improve the infrastructure upon which we depend for a civilised existence. Your local planning authority is responsible for deciding whether a development, anything from an extension on a house to a new shopping centre, should go ahead. All planning must take into account EU, National policy, National Planning Policy Framework, the London Plan, and borough led Local Plan and policies, as well as relevant made Neighborhood Plans. The NPPF is easy to read and relevant to planning applications and appeals. Planning appeals are undertaken by the Planning Inspectorate, which is independent of the local planning authority (LPA). Planning balance – Planning is about balancing benefits and disbenefits. It is about weighing up the combined weight of benefits, and assessing if collectively sufficient to outbalance the identified disbenefits or potential harm. 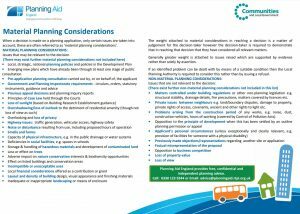 See here for the Planning Portal and a full list of their planning FAQs. Planning conditions – When used properly, conditions can enhance the quality of development and enable development proposals to proceed where it would otherwise have been necessary to refuse planning permission, by mitigating the adverse effects of the development. See Government guidelines here. s106 agreements – are a mechanism which make a development proposal acceptable in planning terms, that would not otherwise be acceptable. They are focused on site specific mitigation of the impact of development. See Local Government Association detailed background on conditions and s106 here. Material considerations – are taken forward into consideration. (Issues regarding licensing are separate to planning matters, and different local authorizes often have different approaches what are relevant licensing matters). However, issues such as loss of view, or negative effect on the value of properties are not material considerations. Generally greater weight is attached to issues raised which are supported by *evidence* rather than solely by assertion. For further advice see The Royal Town Planning Institute (RTPI) who provide an online advice service, and guides. impacts on the road network would be severe. Crystal Palace is unique, as 5 boroughs all meet, so to assess the overall and cumulative impact is more complex. Additionally, three legislated Strategic Road Network (SRN) routes meet here (using the A212, A2199, A234), that TfL highways authority have overall network responsibility for (see here for latest DoT traffic counts). Crystal Palace also splits inner and outer London, each having different respective planning policies. The cross border nature of Crystal Palace also means the area is at risk of more limited cross-border borough provided S106 and CIL contributions and planning. These contributions are meant to provide sub-regional infrastructure to support development within the area, and consideration to (our cross border) need for services (e.g health and education). Conservation Areas – We have many designated Conservation Areas that the meet here. 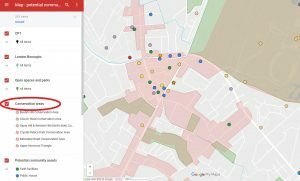 Click here to see pilot toolkit and select “Conservation Areas” to see cross border view of local Conservation Areas. Click here to see more of UCLs neighbourhood planning assessment of our area. Bromley – UDP Proposals Map (online interactive map). Lambeth – Local Plan Policy Map (online interactive map). Click the icon (bottom left) to see layers/options to view SINC and other planning constraints. Southark – Southwark Map2 – (online interactive map). Tree Preservation Order (TPO) zones. Click the icon button to see layers/options to view. Grape & Grain – effect of the proposal on the character and appearance of the host building and on the Conservation Area. Appeal dismissed. 25 Church Road – D2 / Cinema use and the vitality of the town centre Appeal dismissed. Gipsy Hill Station – installation of an Automated Teller Machine at the front of the main railway station building at Gipsy Hill. Appeal dismissed. 2 Alma Place – The appeal is dismissed in so far as it relates to a new second floor with mansard roof. The appeal is allowed in so far as it relates to a rear extension. Split Decision. access. The appeal is allowed subject to conditions. Crystal Palace Park Masterplan – use of enabling “Very Special Circumstances” in permitting housing on Metropolitan Open Land. View current and previous appeals with the Planning Inspectorate for “SE19” or by street click here to search.